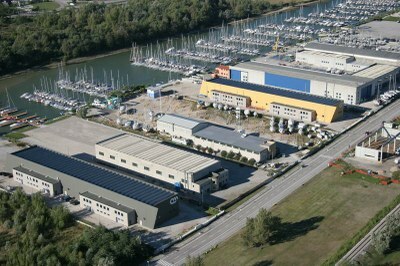 Schiavetti-Brancolo is a homogenous industrial area and extends across the municipalities of Monfalcone and Staranzano. Among the production plants are Fincantieri, Nidec ASI and SBE. The area of Monfalcone was developed since the sixties and seventies of the last century with mostly publicly owned industrial plants and some private equity firms such as the flour milling company De Franceschi. Today the area is home to engineering companies, electromechanical companies and production plants for bolts, internal combustion engine valves and other industrial products. Next to companies of national and international standing there are many smaller companies who are essential suppliers to the massive production of Fincantieri. The intermodality and a constant improvement of connections are the key elements for the development of the area: the immediate access to the main road to Grado and the construction of a railway siding to the station Ronchi Sud in fact facilitated transport and connection between tenant companies and the exchange of manufacturing materials with the outside world. The industrial area of the City of Staranzano is continuously growing too and there are many works of urbanization in the design, including the construction of a bridge crossing the resurgences and a road connecting the SP 19 Monfalcone-Grado with the roundabout in front of the airport. This area is home to many companies active in different but complementary fields: such as carpentry, mechanics, refrigeration industry, food production, construction, services, etc.